When things get severe in the skies above, you can bet one familiar, hatted figure will brave the elements for a quirky video beneath the Lee's Chicken Sign on Broad Street, where he often states the obvious, but in a highly theatrical and entertaining way. 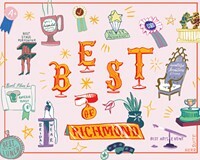 For eight years, author and Richmond Magazine columnist Harry "the Hat" Kollatz has produced this wacky segment with an intern camera operator and occasional guests. Whether shouting the name of winter storm "Khaaaan!" like William Shatner, taking swipes at Pokémon Go, or getting a musical assist from sax man Roger Carroll, Kollatz's own comedic skills help lift this free-flowing, low budget report to required viewing: "Bombogenesis is not the genealogy of a hobbit!" he might exclaim to a spewing sea of passing vehicles on Broad Street. Even though he founded Firehouse Theater and has been a part of local cultural life for a quarter-century, it's the Lee's Chicken Sign Weather Report that just might be the Hat's official legacy. He tells Style that on at least two occasions when he was away, other people picked up the slack and taped episodes. Among his future goals: Get real comedians to tell rapid-fire "it's so hot" or "it's so cold" jokes under the sign; score a guest appearance from legit NBC-12 forecaster Andrew Freiden, and use the springtime tune from "Carmina Burana." But don't think he's getting fat on promo chicken. "I can report that we've received heard neither from the offices of Cease and Desist nor received in-kind chicken, not fried, or roasted, or spicy," Kollatz says via email. "Just to be clear: there's no quid pro chicken."